Though I'm in the same city as her, I'm staring at an image of Poppy on a computer screen. 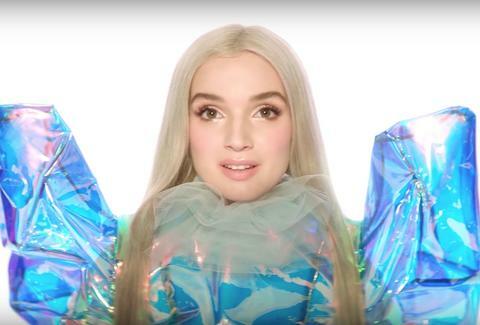 It's probably the most Poppy way to conduct an interview with Poppy, the internet's most enigmatic digital pop star. In her many non-music videos, the singer often exists in a white void where she delivers repetitive, koan-like statements in a soothing, ASMR-friendly voice about topics like fame, eternity, or Doritos. Occasionally, cults come up. In one video, her nose bleeds. When I dial the Skype number that's been provided for me and the laptop is passed to Poppy, she's wearing a pink coat, Poppy Lissiman sunglasses with roses on them, and a surgical mask. I'm living in a Poppy video. "Hello!" she says, her soft voice barely audible through the tissue covering her mouth. It looks like she's been quarantined. Like a deadly outbreak occurred. Like she's the last celebrity on Earth. "I'm sick," she explains when asked about the mask. "It's so I can't get anyone else sick." Even if containment is the goal, Poppy is spreading. Building on the mystery created by this 2015 viral clip of her repeating "I'm Poppy," which has been viewed over 14 million times, her debut album Poppy.Computer was released via Diplo's Mad Decent label in October last year, and a North American tour followed. 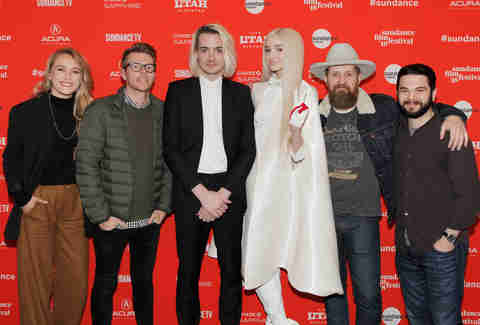 Initially, this publicist-arranged press interaction, which coincides with the Sundance Film Festival premiere of her YouTube Red Series I'm Poppy, was scheduled to take place at the YouTube House in Park City, Utah, where she also performed and conducted interviews throughout the week. ("It was really fun," she says about her set.) But the YouTube House closed a day early and Poppy couldn't meet in person. Skype seemed like a fitting solution. With Poppy, there's always another layer of artifice: Her real name is Moriah Pereira, as most of her fans (called Poppy Seeds) know, but, in our brief time together, the facade never breaks. She really is Poppy. To her left sits her collaborator, Titanic Sinclair, the writer and producer of I'm Poppy. Like Poppy, he was born with another name: Corey Mixter. With his platinum blonde hair, Sinclair looks a bit like Robert Pattinson in Good Time, or Kurt Cobain if he went to art school. He's the more talkative of the two, commenting on the surrealness of Sundance and offering up answers to questions about the inspiration for the show. According to him, it's based on his and Poppy's experiences in Hollywood. "I guess we always had a bigger story that we wanted to tell," says Sinclair. "It seemed like this format, the longer length and getting more characters involved, was a natural progression from what most people are familiar with on our YouTube videos and the stuff we have online." Poppy puts it more succinctly: "There's a void and we're filling it." The exact manner in which they're filling that void is by staying true to the Kenneth Anger-goes-vlogging sensibility that's served them well up to this point. The first episode of I'm Poppy, which was released on Friday, isn't an attempt to make Poppy more palpable to mainstream audiences; it's as bizarrely impenetrable as her minute-long YouTube clips. Freaks and Geeks' Sam Levine has a role as a network executive, and the behind-the-scenes structure is similar to other showbiz stories, but it also starts with a sacrificial killing and gives ample screen time to a mannequin named Charlotte, who becomes obsessed with destroying Poppy. The tone is dark and menacing. Lynch-ian, even. I'm Poppy understands (and broadly satirizes) the desperation that drives internet fame. When Poppy says, "The best part of being alive is when someone subscribes to my YouTube channel," it's hard not to think of the controversy that engulfed YouTube star Logan Paul earlier this year, when he discovered what appeared to be a dead body in Aokigahara, the "suicide forest" in Japan. Where others might have seen something horrifying and sad, Paul saw content and posted a video with the body in it. Similarly, for Poppy, likes and views are the only currency that matter. Despite the occasionally heavy subject matter, Poppy describes making the show, which they've only shot a pilot for so far, as the most fun thing she's ever done. According to her, the biggest difference between working with YouTube Red and making her normal videos was that I'm Poppy cost more money. She got expensive clothes. She had her own dressing room. She spent time with her favorite people. "I wasn't acting," she says. "I was just telling the story." From here, the goal is to keep making more episodes of the show, to expand the Poppy universe in new ways. Sinclair clearly sees Poppy as an antidote to a barren, vapid pop culture landscape. Taylor Swift is a frequent target of his critiques on social media, but she's not the only artist in his crosshairs. His contempt for the music industry is more systemic. "It always rubs me the wrong way when I see some super-mega-famous, rich celebrity trying to pretend they understand the normal person's life," he says. "I think what we're doing is a lot more sincere than so many of the pop things. Just turn on the radio and listen for 10 seconds and it's some singer that you can't distinguish from any of the other ones and the production all sounds the same and the songs are all written by the same three people. Everyone is just trying to say something and nobody's saying anything." What exactly is Poppy trying to say through her work? "That I'm Poppy," she replies. Talking to Poppy is a bit like conversing with an Alexa. You have to keep providing questions in order to get a response -- many comments end with confusion or silence -- but if you get a good rhythm going you can discover interesting little details. Not quite glitches in the matrix. They're more like hidden bits of code. Secrets you can unlock. Toward the end of the conversation, I ask Poppy and Sinclair what they like to do for fun on their days off. They both insist that they've been so busy lately making videos, recording songs, and touring that they rarely have time to do anything else. Sinclair hasn't even seen the new Star Wars movie, which he was looking forward to. When I ask Poppy her favorite Star Wars character, she doesn't hesitate to respond. She says R2-D2, the non-verbal droid partner to the more talkative C3PO, is her favorite. Sinclair agrees. He likes the way George Lucas got you to empathize with the little trash can robot. I mention that Poppy would make an excellent Star Wars character. You can picture her singing at some Cloud City bar. A ghostly figure in the background of a never ending space opera. "I'd love that," says Poppy. "Can you put that in the article and then maybe they will hear that?" Sinclair nods and laughs, another plan possibly already in motion. "Yeah," he says. "We need to plant the seed." The bigger the screen, the better.